Last week in part one I clarified the problem and framed the situation. This week in part two are the solutions. To sum up last week's post, the core challenge today is enabling affordable proximity. Because we have mostly failed at that challenge, COLA/discretionary incomes are stagnant or down, reducing peoples’ ability to upgrade education/skills, start a business, or own a home – and resulting in a general malaise and lack of prosperity. Supply of commercial and residential space: overregulation and overplanning restrict the supply of both dense urban space and less dense suburban space, making it unnecessarily expensive and driving up costs for both residents and businesses. Mobility: increasing mobility increases proximity. The appropriate measure of proximity is travel time, not distance – what matters is that you can reach your job in 30 minutes, whether that’s 3 miles or 30. Increased mobility opens up the supply of housing within an acceptable commute time from a job center. Reducing overregulation and overplanning to make it easier to add to the supply of both residential and commercial space at both urban and suburban densities. An additional benefit is that the construction industry can provide good paying jobs for low or semi-skilled labor. Increasing mobility: Although there are definitely practical limits, invest in road infrastructure, especially freeways. Generally speaking, recent investments in rail transit have cost far too much for the number of people moved. The future of mobility is becoming increasingly clear: self-driving cars, taxis and buses combined with phone apps to enable more efficient vehicle use through ride sharing (i.e. getting more people in each vehicle for each trip). Simulations show that freeway capacities may increase 2-3x with automated vehicles, and that’s not even taking into account potential increases in passengers per vehicle with ride sharing apps. Self-driving vehicles also better enable dense walkable neighborhoods by reducing parking needs. In the shorter term, the wise investment is a high-speed, congestion-priced, managed lane network used by buses, vanpools, and carpools/ride-shares. Those same lanes can host self-driving vehicles as they become available in the future. For those concerned about the environmental impact of cars, consider that increasing the number of passengers per vehicle reduces the per-passenger-trip impact, and that future vehicles are likely to run on cleaner fuels such as natural gas or renewable electricity. Additional benefits from increasing mobility include increasing incomes as new jobs with a better skills match and higher pay open up within a reasonable commute range, and increasing the base of potential customers and employees new and existing businesses can draw on. For many years now, economists have lamented the global "new normal" of sluggish growth in the developed economies of the world, including here in America. I recently outlined a "big picture" view of Opportunity Urbanism and how it applies to this problem, and I'd like to share it with you here in the hopes of getting some good feedback in the comments. Today is part one where I clarify the problem and frame the situation, and next week in part 2 I'll get to the solutions. What people really want is a feeling of prosperity (i.e. a high standard of living), the measure of which is really cost-of-living adjusted incomes (COLA incomes), not just nominal incomes (see graph below). By redefining prosperity this way, policy levers expand from just trying to increase incomes to also trying to reduce costs, especially housing costs (the largest driver). Another way of thinking about COLA incomes is discretionary incomes – income left over after the basic costs of living, including housing. Increasing discretionary incomes not only directly stimulates the economy with increased consumption, but also makes it easier to pursue additional education/skills, start a business, support charities, or save up the down payment for house. Discretionary income is the fuel of economic growth and opportunity. The global marketplace and technology dictate incomes for a given education/skill level, which make it a very difficult lever to increase. But costs-of-living are strongly driven by local factors that can be controlled. As the basis of the economy shifts from industry to services, proximity to others matters more than ever before. A factory can be anywhere and ship its products anywhere, but, generally speaking, most services need to be in-person. This is pushing more and more of the population to agglomerate around major metros, and limited housing supply has driven up home prices and rents in those metros. Economic and technological factors have directed ever more wealth to a relatively small population of elites, creating another driver of proximity as the services spending of those elites is a major part of the economy. Economic opportunity is driven not just by proximity to others in general, but by proximity to these elites specifically. This is yet another driver of major metro agglomeration and higher housing prices. This lack of affordable residential space is shrinking family sizes and leading to destabilizing demographic implosions in Europe, Japan, and now the U.S. and China. To sum up, the core challenge today is enabling affordable proximity. Because we have mostly failed at that challenge, COLA/discretionary incomes are stagnant or down, reducing peoples’ ability to upgrade education/skills, start a business, or own a home – and resulting in a general malaise and lack of prosperity. Next week: the drivers of affordable proximity and strategies for increasing it. Levees can fail: Sure, anything can fail, but how many times have levees and dikes successfully protected New Orleans or the Netherlands vs. the number of times they failed? Does one failure mean dozens of other successful protective events don't have value? And the nice thing about Houston over New Orleans is that we are *above* sea level, so if there is a failure, it will just drain right out as the tide recedes, as opposed to stagnating in the big bowl of below-sea-level New Orleans. Levees cause stuff to be built where it shouldn't: Sorry Netherlands/New Orleans/Houston, you built stuff where you shouldn't have because once a decade mother nature is going to come at you with wallop. Rather than protecting yourself, you really need to just shut it all down and move somewhere else - nevermind the trillions of invested infrastructure. Wait, you say, it's kinda hard to operate a port without being connected to the ocean. Well, I'm sure you'll figure it out. The key is lovability/walkability: I'm pretty sure New Orleans had that in spades, and it doesn't seem to have saved them from Katrina. Nor did it help the quaint walkable sections of Galveston during Ike. And I'm sure the Dutch will be disappointed to learn they could have saved billions on dikes over the years if they had just loved their country more, maybe with just a good handholding and kumbaya singing session every time the North Sea threatened? His calling out of my op-ed with Joel Kotkin: "Walkability is not some concept being forced down our throats by elitist planners from the East Coast, as some suggest. (See, for instance, "Economic diversity helps Houstonians live well" by Joel Kotkin and Tory Gattis.)" Actually, if you look at the stated goals of those smart growth planners, they *are* trying to force dense urbanism down our throats, and they specifically call for restricting or eliminating suburban development. We are not opposed to walkability and walkable development like town centers, but we are opposed to forcing it on people by restricting other forms of development which leads to unaffordable housing, widening inequality, reduced opportunity, and a weakened middle class. I totally agree that some people love walkability (including myself), and we need to loosen any regulations that make it hard to develop (agreement with him on this point), but let the market decide how much demand there is and how much and where to build - not central planners. 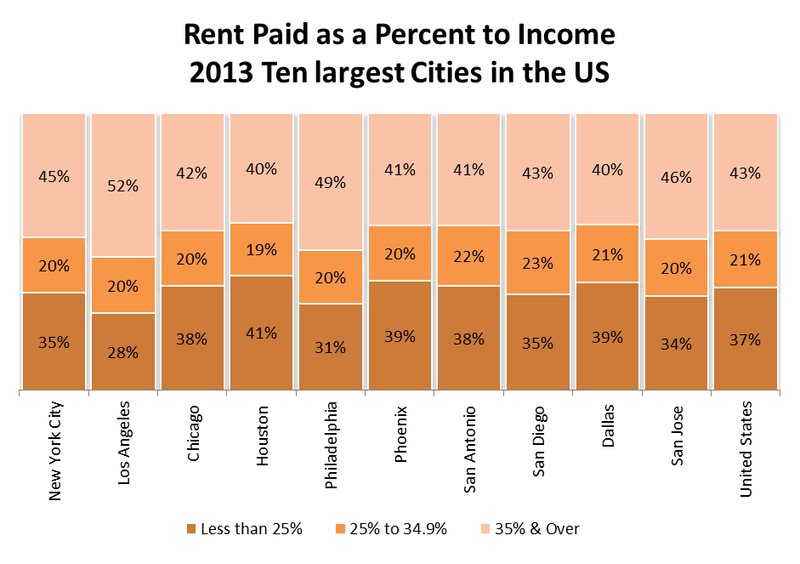 "People in Houston currently spend as much on transportation as they do on housing. " Lies, damn lies, and statistics. As I've pointed out here before, when you have affordable housing like we do in Houston (albeit rapidly getting less so), people tend to splurge on very luxurious cars, trucks, and SUVs - but that does not mean that's the cost of transportation here. Everybody can get around Houston quite affordably in a Honda Civic, Toyota Prius, or plenty of other cars - they just choose not to. The 2013 C2ER ACCRA Cost of Living index takes this into account, and rated Houston 95.6 for transportation costs where 100 = the national average, so we're 4.4% below the national average. New York is at 110, Chicago at 124, DC at 106 - so much for dense transit cities reducing transportation costs. "Spending less on transportation would mean you could afford more durable construction." While I agree we should have strong construction standards for wind, how does one build more durable construction for a tidal wave surge of water? Should we build everything on stilts? How incredibly expensive and inconvenient would that be, not to mention not very walkable? Maybe we should, um, build a dike so we don't have to worry about the surge in the first place and can build simply at ground level? "Walkability means you might see your neighbors more often. Knowing who your neighbors are is a key element of resilience. Social capital is the glue that holds communities together, and places that have it back from catastrophe much faster." Does anybody else remember all the stories in Houston after Ike of people helping each other out and throwing block parties to grill meat before it spoiled in unpowered fridges and freezers? Does anybody remember our amazing response to the Katrina refugees? I think we're doing pretty well on the social capital front. And I'd like to point out that the most dense and walkable city in America, New York, is not exactly known for its friendly "social capital". "Many people in New Orleans died because there was nowhere to run in a vast unbroken sea of single-family homes" Actually, the people that were stuck in New Orleans for Katrina where the ones without cars who relied on transit and walking. Just about everyone with a car got out successfully. To sum up, walkable development is great, and we should certainly enable and encourage more of it, but it is absolutely no substitute for protecting our region from a direct hurricane hit with a strong physical barrier. Let's not mix up our priorities here. We know what we need to do - we just need the political and financial will to do it (and here's how to pay for it). TXDoT has changed the 290 plan from 3 reversible HOT lanes to one. At first I was pretty disappointed in this, but a friend pointed out that the upside is that it may accelerate building of the parallel Hempstead Tollway, which would be a good thing. If 290 had 3 reversible lanes, I'm not sure Hempstead would ever get built. The Atlantic on Why Middle-Class Americans Can't Afford to Live in Liberal Cities - Blue America has a problem: Even after adjusting for income, left-leaning metros tend to have worse income inequality and less affordable housing. Hat tip to Jay. Continuing the theme, Wendell Cox discusses Paul Krugman and "wrong way cities" that are killing their standard of living by making housing unaffordable. The Antiplanner with ten economic principles for planners, part 1 and part 2. This is pretty basic Econ 101, yet he's right that a lot of urban planners ignore it. Economic principles should be added to the core curriculum of all urban planning degree programs. 1. Capital costs are costs. 2. Maintenance costs are operating costs. 3. Economic growth requires new economic activity. 4. New economic activity requires lower costs or higher quality. 5. Whenever possible, user fees are the best way to pay for infrastructure. 6. There’s no such thing as a free lunch. 7. If you subsidize something enough, people will come, but that doesn’t make it a success. 8. If you create of shortage of something, the price will go up, but that doesn’t mean you have increased demand. 9. Demand is a line, not a point. 10. If most people who like something fit a certain demographic, that doesn’t mean most people in that demographic like that thing. Those principles lead directly to this post with 4 logical arguments against rail, and this post with a pretty comprehensive and devastating case for why BRT is superior to light rail in almost every way. Light rail is slower, lower capacity, less flexible and yet far, far more expensive! And now taking those arguments to our local situation, it looks like we're getting dramatically reducing returns from our new rail investments, just as I feared. METRO released statistics on the expanded Red Line (known to most people as the Main St. Line), and they're grim. Back when it was only 7.5 miles, it got 1,162,000 boardings/month, and after increasing the length 73% to 13 miles back in December, ridership only increased 22% to 1,419,000 boardings/month in September. This means that the new miles are generating far, far fewer trips than the the original length, and does not bode well for the future lines if they're just as unproductive at generating new trips. Great presentation on the future of self-driving cars and their impact, including on transit (presentation link came from this blog post). This story asserts that it could more than double freeway capacities, which would be a godsend for us. 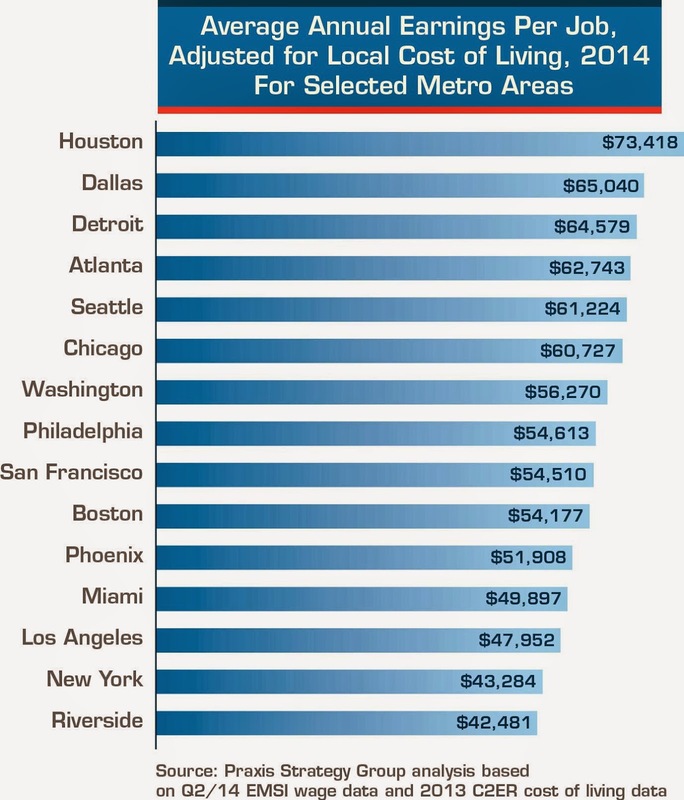 Great graphic from the Houston Planning Facebook feed showing that Houston is still more affordable than comparable sized cities.